A few years ago, in the St. Nikola area located between Bansko and Dobrinishte, archaeologists made one of the most unexpected and mysterious discoveries – theNameless town. The area of​St. Nikola has been worshiped for a long time by the residents of Bansko and Dobrinishte. It is also a favorite place for walks of the locals and the guests of the two neighboring cities, as it reveals incredibly beautiful views. 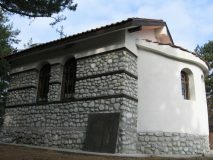 Therefore, in 2003, the Bansko people together with the people of Dobrinishte decided to restore the old St. Nikola chapelwhich had risen years ago at the top of the hill. The decision was made. They gathered funds to restore the temple and began clearing the terrain. But in the first few minutes of clearing, something unexpected happened. The workers’ pickaxes stumbled upon the foundations of an old building. The surprise of the find was very big as no one imagined that there had ever been a human activity in this place, let alone a permanent settlement. But the foundations of the building were there in front of everyone’s eyes, and this meant that the ground beneath their feet had a secret that wanted to be revealed to them. Thus, by chance, a whole town that is now popular with the name of the Nameless town saw the light of day. After the accidental (and surprising) discovery, a team of archaeologists led by the archaeologist and curator of the Bansko Museum Complex Vladimir Baryakovbegan revealing the foundations of the building which turned out to be an early Christian basilica of the IV century. The Christian temple belongs to the early Christian single-apse and single-nave churches, and on the basis of its architectural peculiarities the experts dated it to the beginning of the 4th and the beginning of the 5th century. But surprises did not end here. A necropolis with 28 graves was discovered in the immediate vicinity of the church in which, unfortunately, no funeral gifts, drawings or other documents were found to somehow help the archaeologists in their search. The lack of any information is upsetting, but one thing amazes everyone, and that is the size of the skeletons found in the necropolis. The skeletons were between 1.80 and 2.00 meters in height which was a huge size for the times they lived in. Based on facts about the average size of people who lived many years ago, and on the basis of historical data, scientists have come to the conclusion that the skeletons are of people from the Thracoan Dii tribeknown to have inhabited these lands and which had enormous size for the standards at that time. Experts also refer to the texts of Homer which tell how the Greeks attracted as allies the Thracian tribes inhabiting our lands. Homer’s textsmention a Thracian king of enormous size who arrived on a white horse. The Thracian brought warriors with him who were also very tall, strong and slender. In spite of all the unique discoveries, the excavations of the area stopped because no artifacts were found neither at the basilica nor at the necropolis to indicate that there was something more in this place. There was no evidence that there had ever been a fortress, a town, or any other form of permanent settlement on the hill. The only one who did not give up on the idea that maybe the land under the hill had many more secrets was Vladimir Baryakov who continued his research. He followed the work of the treasure hunters who did not stop circling the area in the hope of discovering something that meant they had some data or at least assumptions something may be hiding below. With the very first holes of Bansko‘s Nameless Town, in front of the eyes of archaeologists and workers, the outlines of fortress walls, homes, streets, warehouses started to appear and there were so many ceramics that part of the discovered pieces were used for wall-building. Layer by layer, the town that has no name began to reveal its secrets. It turned out that there had been a life from more than 3500 years ago, a stunning discovery not only for our country but also for Europe, and the cultural layers that the archaeologists discovered dated from 3000-2000 B. C. to the Late Middle Ages (XVII century). Every layer that the archaeologists revealed told its story. The outlines of a 25-decare town were revealed. Situated in a convenient strategic location with good visibility of the area, the town was protected by high, steep rocksand, where needed, tall, stone defensive walls were raised to provide defense and protection for the population. The construction of the fortress wallsconsisted of cut stones bonded with mortar and broken bricks. The inner part of the town located on an area of 5 decares was also surrounded by double fortress walls and had watch towers at the main gates. In the process of excavating the inner town, a second early Christian churchwas discovered, but this has not yet been fully explored. In one of the upper layers, experts found evidence of a fire that suggests that Bansko’s Nameless townhad been overtaken by a great fire devastation about which no one can tell whether it occurred accidentally or due to an attack by enemy troops. 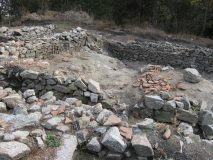 For several seasons, the team of Vladimir Baryakov excavated an area of 600 square meters and besides remains of fortress walls, temples and homes, many bronze ornaments, among which bracelets, fibulas, buttons, buckles, appliquesas well as a unique ring with two figures and part of an ancient plate of a Thracian rider were found. The discovered over 50 pithoses created an impression; the find speaks of advanced trade and production of various agricultural products. Interesting is the huge number of coins found in the Nameless town of Bansko. The coins are over 200 and are from different periods (from the 3rd to the 17th century), which indicates that the town existed for a very long time. Archaeologists have discovered a large number of glass objects which strongly suggests that the settlement was not only large but also quite rich. In those distant times the glass was very expensive and valuable, and only a rich population could afford to own so many glass objects as were found in the town. One of the great puzzles archaeologists face is the open sanctuary in the eastern part of the area. The sanctuary is situated on a rock massif and it can be reached by stone steps carved in the vertical rocks. On the way to the sanctuary, as well as on the rock on which it is built, two rocks cut into the rocks were found for which the archaeologists still have no answer as to who are the people or the gods they are portraying. Experts believe that the sanctuary is Thracian, especially since the graves of the “tall” people from the Thracian tribe Diiwere discovered nearby. There are many other secrets that the town which has no name is protecting and which we hope will be revealed in the years to come, but what has been revealed so far is something extraordinary and unique. The biggest mystery, however, is thename of the town! Neither excavations nor documents, legends, or myths mention the name of this large and rich settlement which is really quite mysterious. Archaeologists hope to find some inscriptions to shed light on the issue, and at last the name of the town to become clear. But until then we will all call the ancient town by the name of The Nameless town. What awaits you if you decide to visit the fortress while on holiday in Bansko? 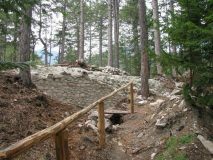 The studies of Bansko’s Nameless Town are still at the beginning and there are not many sites that are fully revealed and that you can see but still there are several rooms, the remains of which you can; you can also visit the restored temple of St. Nikola. How to get to the ancient town? The Nameless town is located on a natural hill in the foothills of the Northern Pirinin the St. Nikola area, 4 km from Bansko. Its exact location is with the following GPS coordinates:41°48’42’’ NL and 23°31’54’’ EL. You can reach the landmark fairly easily, even if you do not use a GPS system. Once you leave Bansko and head for Dobrinishte, after about 1.8 km you will see a sign indicating that you have to drive off the main road and get to the sight. Take a closer look, as the sign on the Bansko sideis not very legible and you can miss the slip road. There are two roads that can take you to the fortress town. Both are dirt roads but it is possible to drive. The first one goes alongside a built cycling trail and if you take it, it will take you to a place where you have to leave the car and continue on foot along the path to the fortress. If you choose the second road, it will take you to the foothills of the Nameless Town. Whichever way you go, you will reach a wooden gazebo from which the path leads to the fortress itself. Here you have to walk on foot, but it’s not scary. As a distance, the road to the top goes for about 20 minutes but it is rather steep so it is advisable to wear appropriate climbing shoes. On the way to the ancient settlement there are several separate resting places where you can relax and enjoy the great views revealed from the hill.